Caudale Moor lies to the left of the picture and Red Screes to the right. 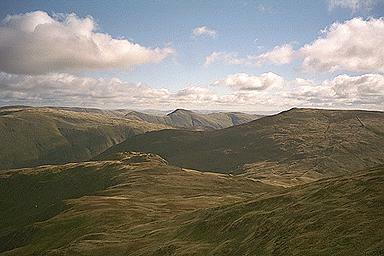 Between them is the southwestern spur of High Street comprising the peaks of Froswick, Ill Bell and Yoke. In front of them is Middle Dodd which leads up to Red Screes. Little Hart Crag appears in the foreground in the centre left of the picture. The route, if not the paths, from Red Screes down to Scandale Pass, up to Little Hart Crag, over Bakestones Moss and up to Dove Crag is clear. Larger version of this picture.